Strenx ... a new high-strength brand. 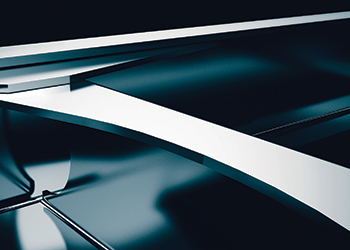 SSAB is launching Strenx, a new high-strength structural steel product brand, which offers an extensive portfolio of high-strength steels on the market. This will open up new competitive possibilities for customers to make stronger, lighter and more sustainable products. Strenx has been designed for sectors where structural strength and weight savings are key competitive factors, especially in the lifting, handling and transportation industry. It is also well-suited for agriculture, the frames of heavy mobile machines, rolling stock, offshore and construction sectors. Now customers will be able to design more competitive and sustainable products – cranes that reach further, trailers that carry more payload, and trucks that use less fuel, says a spokesman for the company. “For customers, this is a totally unique product since Strenx now covers the three product brands Optim, Weldox and Domex that are well-known trademarks of SSAB and the former Ruukki. Strenx embodies our over 50 years of experience in high-strength steels,” says Gregoire Parenty, head of market development at SSAB. Strenx is claimed to feature the world’s widest choice of high-strength structural steels both in terms of strength and dimensional range. Yield strengths range from 600 Mpa to 1,300 Mpa, which is the strongest steel available on the market. Strenx is also available in plate, strip and tubular products in thicknesses ranging from 0.7 mm to 160 mm. “We give full support to designers and customers to help them upgrade to Strenx. By sharing our in-depth experience and wide knowledge of steel, we can guarantee the best results for end-product performance,” says Parenty. Strenx comes with guaranteed product consistency, services to help customers’ businesses and permanent assistance to enhance end-product performance. SSAB is a Nordic and US-based steel company that offers value-added products and services developed in close cooperation with its customers to create a stronger, lighter and more sustainable world. SSAB has employees in more than 50 countries, and production facilities in Sweden, Finland and the US.